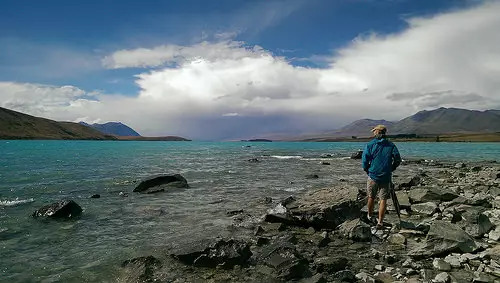 For travellers who visit the South Island, Tekapo is always at the top of the list. It’s not hard to figure out why: that picturesque lakefront and alpine scenery is quintessentially New Zealand! But the key question is, how do you get there? Most travellers take the southwestern route along State Highway 1 from Christchurch, the main artery through the South Island. This is the most direct route, but not the most interesting; the first section of the journey until you reach Geraldine isn’t particularly scenic. 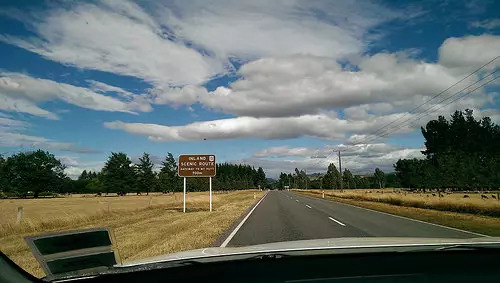 However, there is another option – taking the scenic route to Tekapo. State Highway 77 west of Christchurch takes travellers through the heartland of rural Canterbury. It’s a slightly longer route, but a much more spectacular one! 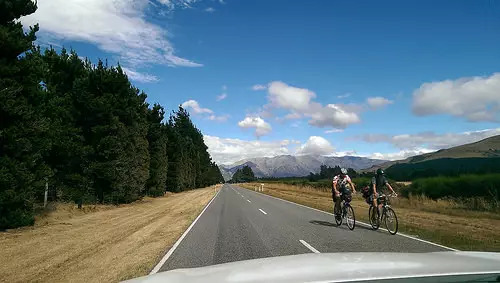 The scenic route to Tekapo 275km and will take you roughly 3 1/2 hours from start to finish. If you start off early in the day, you will have plenty of time for some scenic stops along the way. And trust us, this is a trip where you will want to take a leisurely pace. There is a beautiful variety of scenery as you travel further into the Southern Alps, and some fantastic photo opportunities. The best thing about this scenic route? It’s so much quieter, even in peak season. State Highway 1 is the most-used route through the entire island for tourists, work commuters and cargo alike. In many places, the development of the road hasn’t kept pace with the increase in traffic. Towns such as Ashburton create large bottlenecks which will take you a while to pass through. 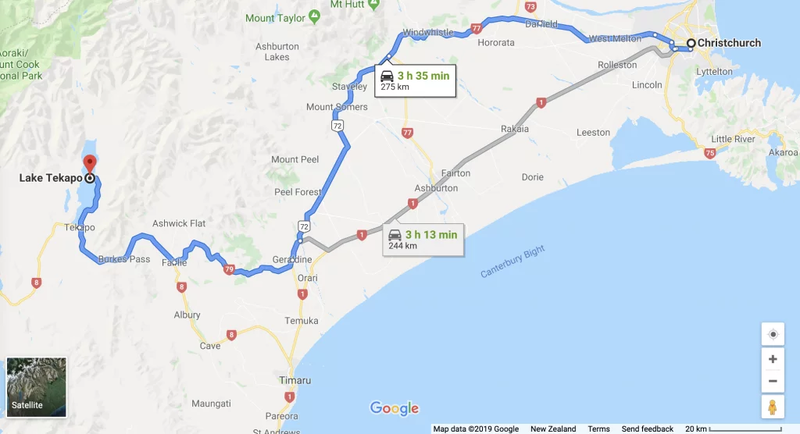 So even though the route is shorter on paper that the scenic route to Tekapo via State Highway 77, the chance is it will take you much longer. 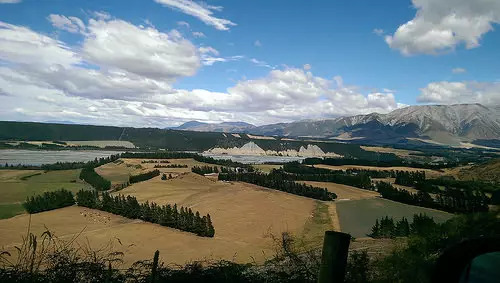 You’ll start the scenic route from the Canterbury Plains – a flat patchwork quilt of wheat and grazing pastures which spans right from the coast all the way out West. This is what helps give Christchurch and the region such a quintessentially English look. The first settlement you will pass through is Darfield, which is where you will find the turn-off for State Highway 77. Before you know it, things get a lot greener. All it takes is a quick check of a map – and the minute you look up, you might think you’re in a different region. Once you hit Glentunnel and Windwhistle (well-named!) everything is suddenly much more lush with a lot more trees, and the land begins creeping up around you. We passed these cyclists this morning – it looked like an enjoyable ride as they had the sun on their backs. Little did they know, the weather was about to change! It’s such a neat experience on the scenic route to Tekapo when you first catch sight of the Southern Alps. At first, gently rolling hills appear – classic Lord of the Rings Country! Michael expects that I should be able to name each individual mountain (he actually can!). After Glentunnel, it’s up and around to the beautiful sight of the Rakaia Gorge. The Plains has its fair share of rivers coming off the mountains, and the Rakaia River is one of the most striking. 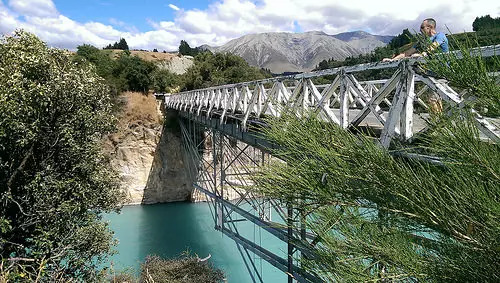 ‘The water of the Rakaia is typical of a New Zealand high country river. The unusually milky green colour is the result of sediment released from the movement of the glaciers. It’s one of the highlights on the Tekapo scenic route. It’s definitely worth a photo! The next stop is the town of Geraldine. We really recommend checking out the family-owned Barker’s Store. This brand is a kiwi favourite, and was established right in this very town. The shop is actually just down the road from the original family farm. 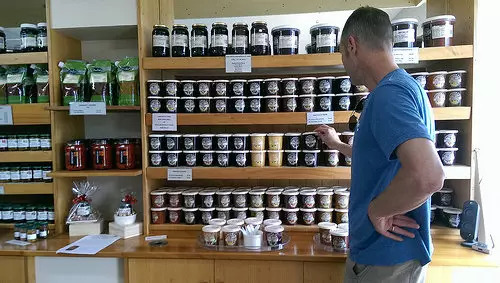 They sell quality preserves, sauces, and other homemade products. This shop has been going for years, and it’s always nice to buy local on your travels. My only gripe is that they’ve changed the recipe for their blackcurrant jam! Further down the road, you’ll find a very good artisan cheese shop, Talbot Forest Cheese. A great thing about Geraldine is that it has an excellent Fresh Choice Supermarket off the main road just as you come in. If you’re staying in Lake Tekapo, you might want to stock up now. On the whole, supplies tend to be much cheaper here than in the supermarket in Tekapo. This is common across rural areas across NZ. Unless you can’t avoid it, we recommend trying to do your grocery shopping in urban centres. The cafes in Geraldine provide the generic filled bread rolls and paninis – enough to keep the masses happy. As a small town, Geraldine isn’t really the place to go looking for exciting fare. However, the coffee we had at Plum Café is excellent! As we left Geraldine, the weather is turning and much-needed rain is beginning to fall. I swear there are farmers doing cartwheels of joy as I speak! It’s taken us four and a half hours, including all of our stops, and we’ve arrived at Lake Tekapo. This is truly one of the most peaceful vistas in the whole country. It’s always incredible to take in the colour of the lake – it looks as though it’s been put through a filter! Be sure to check out the St. John Observatory while you are here: the dark skies around Tekapo are breathtaking! Happy travelling on the scenic route to Tekapo! Oh gosh you are so right – that inland scenic route is a sight to behold. 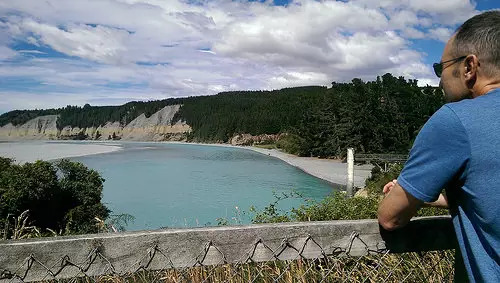 Coming down into the Rakaia Gorge and seeing the turquoise waters – magic! Wonderfully described drive Pam and Michael. Enjoy your time at Lake Tekapo – hope the weather co-operates for some star gazing, although I know they, like us are desperate for the rain. Jan, I couldn’t believe the colour on the Rakaia and this morning the waters on Lake Tekapo were the brightest turquoise. Rediscovered the hot pools and the café there and went for a long walk around the lake. It’s really sunny here at the moment. What a great trip – and the promise of jam at the end! The water is such an amazing colour. Hey Jane, we’re having very clear skies at the moment and holding our breath that it will last until tomorrow, because we’re doing the Mt John Conservatory tour. Hoping for some great stargazing moments (the Jam can wait). 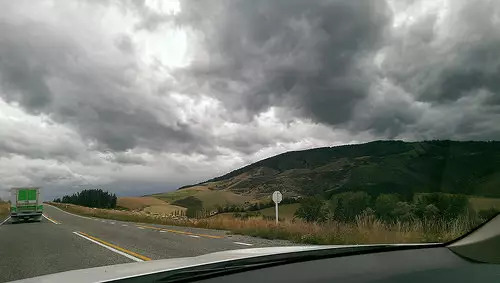 I am going to fly from Auckland to Christchurch this Saturday then I am going to visit Lake Tekapo, I`ve just seen your this article and I want to use this scenic route. Thank you for sharing it with us 🙂 So I just want to know is this the same route?